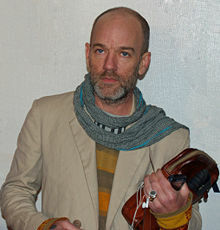 John Michael Stipe (born January 4, 1960 in Decatur, Georgia) is an American singer who is the lead vocalist for the alternative rock band R.E.M. ATHENS, Ga. _ Rock singer Michael Stipe has opened a restaurant here, but it is not lush and plush. Unlike the glitzy Planet Hollywood and other star venues, the Guaranteed is as stripped-down sincere as its owner. Finding a vegetarian restaurant in the South can be difficult. So Sue Hoagland and Amy Bramblett, in partnership with R.E.M. singer and vegetarian Michael Stipe, decided to open Guaranteed, a vegetarian restaurant - and the only juice bar - in Athens, Ga.
. . . do inquiring minds want to know what Michael Stipe really eats behind closed doors? Well, if you ask him whether he's a vegetarian he'll say, "yes," and then tell you that the thought of eating a hamburger at this point of his life pretty much repulses him. If you ask him whether he's a vegan he'll say that he tries to be, but it's hard to bother with it when he's on the road. NATALIE MERCHANT: I met Michael 15 years ago in Atlanta, Georgia, . . . Our second meeting was much better. REM were playing in Buffalo, New York, [no date given for this]. . . Michael was wearing his pyjamas that day, so we made a pretty funny-looking couple when we went to this vegetarian restaurant.